ECG is used to measure the rate and regularity of heartbeats as well as the size and position of the chambers, the presence of any damage to the heart, and the effects of drugs or devices used to regulate the heart (such as a pacemaker). See also stress test and Holter monitor (24h). You are asked to lie down, and electrodes are affixed to each arm and leg and to your chest. This requires cleaning the site and, if necessary, shaving or clipping hair. 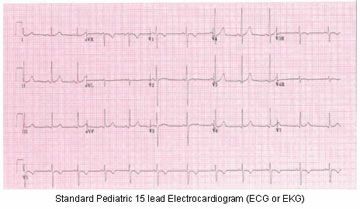 The standard number of leads attached is 12 to 15 for a diagnostic ECG but may be as few as 3 to 5 for a monitoring procedure. You are usually required to remain still, and you may be asked to hold your breath for short periods during the procedure. Sometimes this test is performed while you are exercising or under minimal stress to monitor changes in the heart. This type of ECG is often called a stress test. The results are recorded on graph paper. Before the ECG, tell your health care provider if you are taking any medications. There are no restrictions for food or fluids. However, ingestion of cold water immediately before an ECG may produce changes in one of the waveforms recorded (the T wave). Exercise (such as climbing stairs) immediately before an ECG may significantly increase your heart rate. You may be asked to remove all jewelry and to wear a hospital gown. An ECG is painless. When first applied, the disks may be cold and in rare circumstances, you may develop a localized rash or irritation where the patches are placed. An ECG is very useful in determining whether a person has heart disease. If a person has chest pain or palpitations, an ECG is helpful in determining if the heart is beating normally. If a person is on medications that may affect the heart or if the patient is on a pacemaker, an ECG can readily determine the immediate effects of changes in activity or medication levels. An ECG may be included as part of a routine examination in patients over 40 years old. Heart rate: 50 to 100 beats per minute.